Bridge structures have higher probability of suffering from wind-induced vibration than other types of structure due to its flexible structural characteristic. When the span of bridge is long, the wind load becomes the dominant factor in the bridge design, and the accurate evaluation of wind load and safety from wind induced vibration become essential. Wind Tunnel Tests for Bridges are often designed to evaluate girders, pylons, and cables, conducted on girders, pylons and cables, separately or together . Wind Tunnel Tests are also conducted for guard rails, barriers, or road signs, respectively. TESolution consists of wind engineers that has paved the way in the field of wind engineering for the past 20 years, and have provided solutions to numerous projects worldwide, including Japan, England, Chile, Vietnam, Turkey, and Uganda. ​The Section Model Test is conducted to evaluate wind-resistance stability of the bridge. It is the basic, yet one of the most important tests that is also cost efficient. A rigid model with representation of a section of the bridge, including girders, barriers, and railings for inspection car is used in the tests, which is evaluated through the spring support system, wind force measurement system, and forced oscillator in the wind tunnel. The spring support system allows motion of the model for vibration test, and the wind forces acting on the model are measured by two three-component load cells. Our patented forced oscillator shakes the model in sinusoidal motion with heaving, sway and pitching mode, respectively, to measure flutter derivatives. The test results show the main issues regarding wind stability of the bridge, and with further analysis of these results, our engineers are able to provide suggestions on aerodynamic or structural vibration control systems. ​Pylons for cable-stayed bridge and suspension bridge generally are in slender figure, which are vulnerable to the wind load. The pylons are especially vulnerable when stood alone in the erection stage, prior to the installation of cables, due to their low structural damping properties. Wind tunnel tests of pylon include aeroelastic model tests and wind force tests under various construction stages. Aeroelastic model tests are conducted to evaluate aerodynamic stability of free standing pylon. Wind force tests are conducted to provide wind force coefficients of pylon legs or whole pylon. ​The behavior against wind of the actual bridge is shown as the combination of behaviors from each part including girders, cables, and pylons. Also, when the environment, in which the bridge is surrounded by, causes wind loads not only in the direction of cross longitudinal, but from other directions as well, and when the shapes of decks variate along the longitudinal direction, unanticipated wind-induced vibration from the section model vibration test may occur. ​The full bridge model, which offers extensive three dimensional examination, is effective in such situations. Aeroelastic model is used for full-bridge model test. Aeroelastic model not only reproduce the geometry of the bridge in detail, but also simulate mass, stiffness and damping properties of the deck, cables and pylon. The geometric and dynamic properties of aeroelastic model have to be properly adjusted according to the construction stages. ​​Buffeting responses are random vibrations by turbulent components from approaching flow. 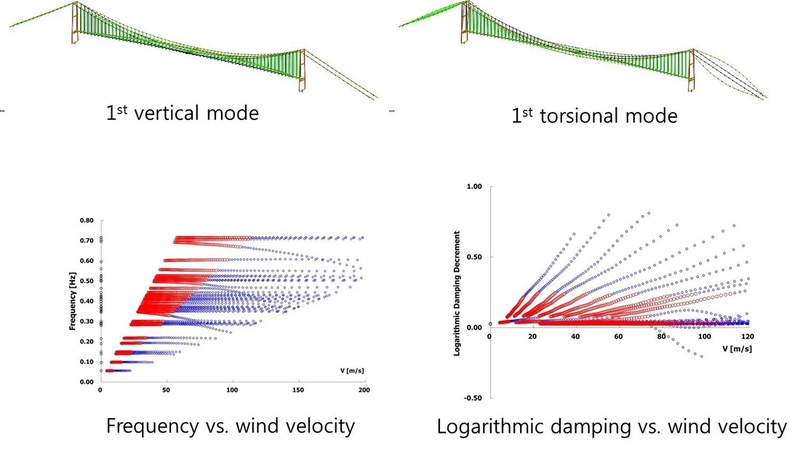 Static deformation by time-averaged wind speed and buffeting response by fluctuating wind speed are computed in the erection / complete stage of the bridge. Aerodynamic data, structural data, dynamic data and wind environmental characteristics for a bridge are used in buffeting analysis. ​​Flutter is an aerodynamic instability caused by positive feedback between the structure’s oscillation and the force exerted by the wind flow. Multi-mode flutter analysis is generally used as an analytic method to calculate the critical wind speed of the flutter. Flutter derivatives, natural frequency, and mode shapes from eigenvalue analysis are used as input data. Flutter derivatives from force vibration test are required for flutter analysis.